It was a Monday night. I wasn’t in the mood for anything loud or crazy. I wanted something mellow and quiet. My old age has brought me to La Grande Orange Cafe in Pasadena — a somewhat under the radar, though not a hole in the wall restaurant, that is a bit on the boring side. The inside was interesting though. It had different rooms with different themes. Adjacent to the restaurant is the Metro Gold Line, Del Mar Station and some luxury apartments. The area certainly isn’t Old Town Pasadena. It’s quiet, a bit boring, and kind of nice. 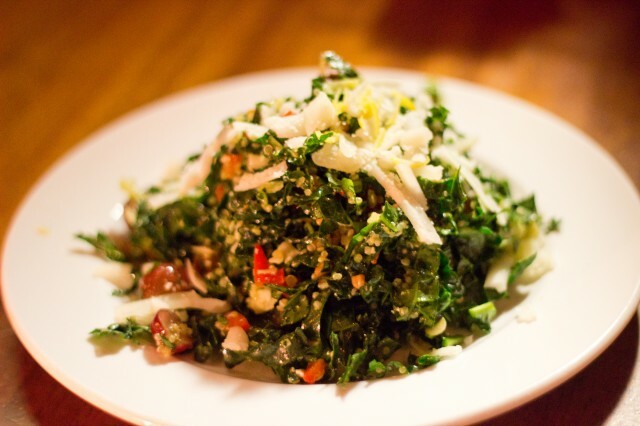 The shredded kale and quinoa salad was refreshing and packed with nutrients. The crunch from the sunflower seeds was appreciated. Sweetness from the flame grapes and citrus from lemon was a nice combo. 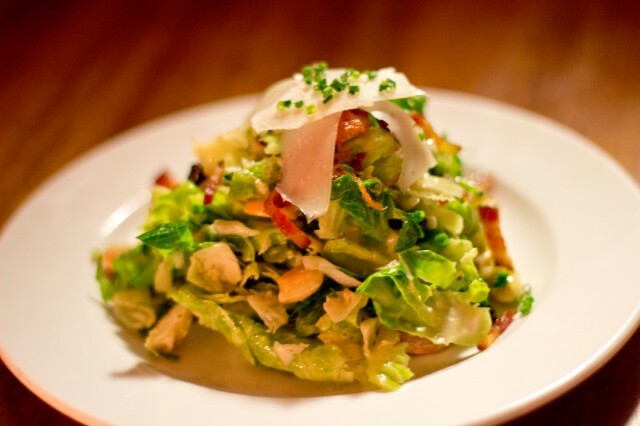 With a fresh shaving of parmesan, the salad was rich and flavorful, with a nice summer zest. Kale is slowing becoming my new favorite green. Last year, brussel sprouts have been getting popular. Never having it in a salad, the Brussels sprouts salad was new and exciting to me. Manchego being one of my favorite cheese, the shaved aged manchego was the best thing for me. The sweet dried berries and smoked almonds were a great balance for this dish. The honey mustard vinaigrette was good, considering I am not a fan of sweet dressing; fortunately, it wasn’t swimming in dressing. Bacon on the salad was optional — I just laughed at that statement. 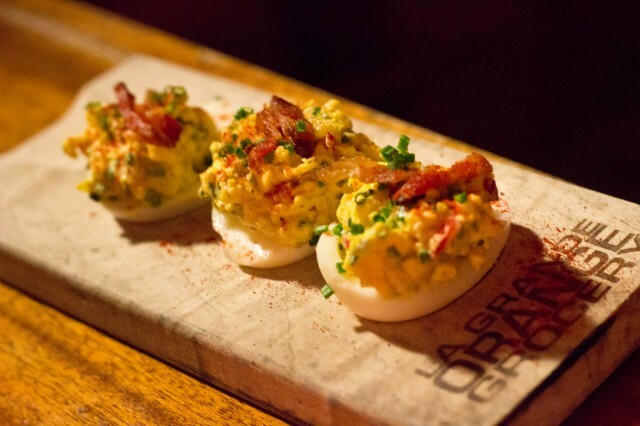 La Grande Orange Cafe is known for the deviled eggs. In hind sight, I should have just ordered it from the DineLA menu. These little bites were perfect. It had a great velvety texture with the right amount of spice and zing. A little drizzle of oil or something could have made them less dry though. Again, bacon was optional, and again, I chuckled. It was a Monday, and my fiancé wanted a drink. Yes, we are making “its a Monday” as an excuse to drink. She ordered the white sangria, and it was refreshing — better than I expected. 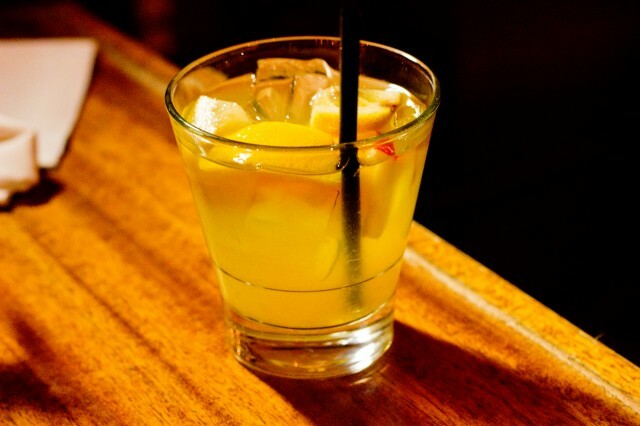 Though a girly drink, it was strong enough to enjoy and well, fruity enough to enjoy. The fresh peach was refreshing and cool. I ordered the wood fire rotisserie chicken. Though kind of boring, the heirloom cannellini beans were a nice touch. The half chicken was a lot of protein to take in, especially the dry breast — dark meat was juicy and well seasoned. The fresh green beans had a nice crunch. A very “safe” dish, but still delicious. I saw Prime Rib on the menu and had to take advantage. 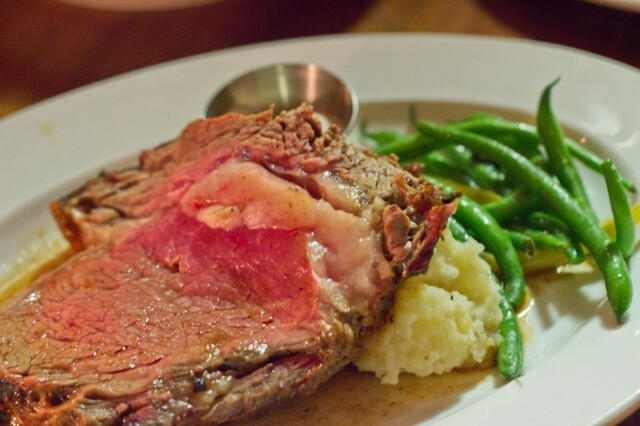 The prime rib was cooked nicely medium rare, though a bit on the rare side. Any less time in the oven, it would have been near raw beef. The mashed potatoes were a bit bland and boring, but the horse radish made everything lively. The green beans brought everything together. 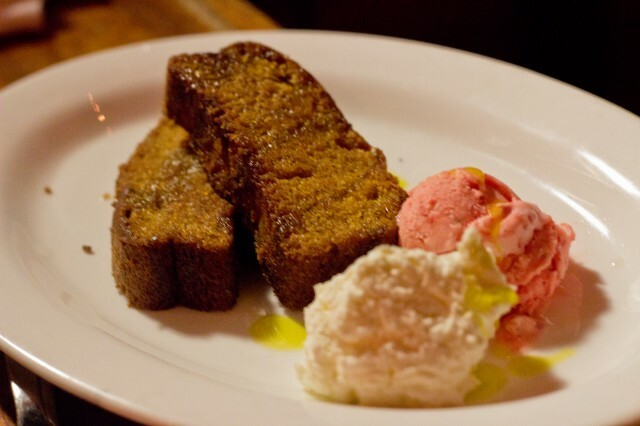 I liked the olive oil cake. It had a very light, yet dense texture, in between a cake and a bread. The mild flavor mixed with the strawberry and vanilla sorbet was a good mix. 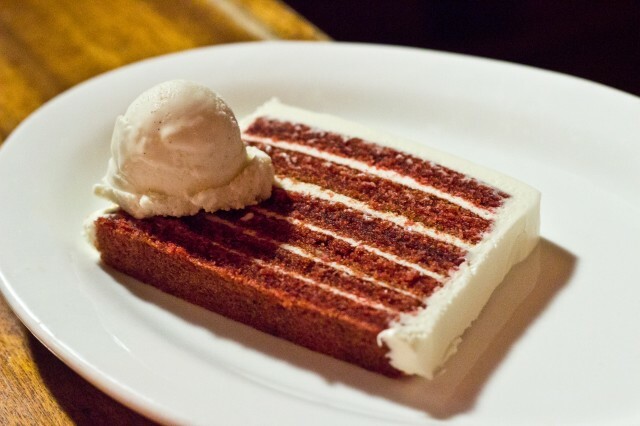 The red velvet cake was awesome. The multilayer of cake was nice to look at and fun to eat. Breaking off layer by layer, each cake and frosting mixture was pleasant. The vanilla ice cream was a nice touch. I mean, who doesn’t like cake and ice cream? 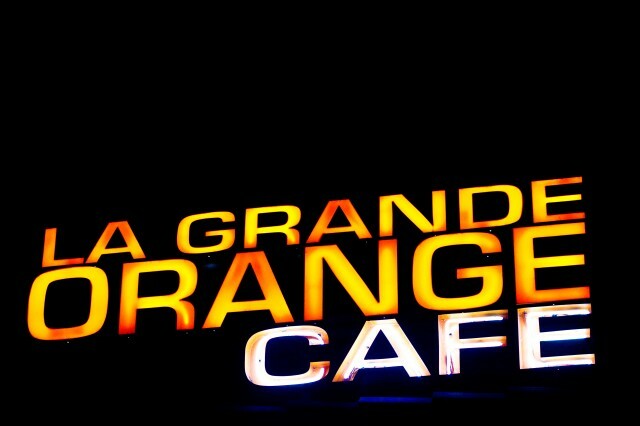 La Grande Orange Cafe was an interesting experience. 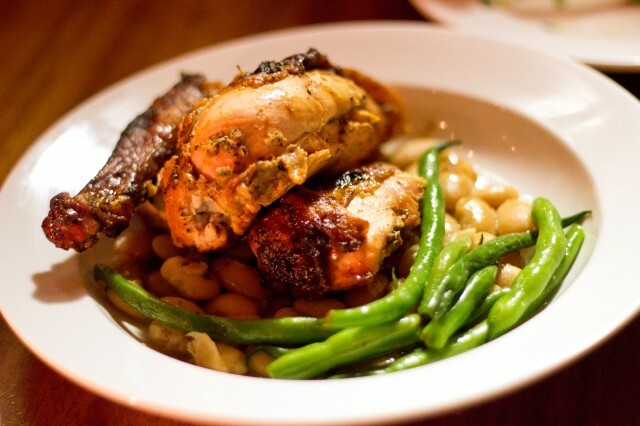 Culinarily, it isn’t as exciting as most restaurants are. In fact, the restaurant is a bit boring. From the food, to the decor, and the wait service, nothing got me excited for anything. It was a Monday night, DineLA was going on, and we just wanted a quiet night together in Pasadena. The food was plenty and everything tasted as it should. The classic styling and menu will never go out of style.